The National Union of Teachers (NUT), Lagos State Chapter, on Wednesday announced that come Monday, September 24, it would be embarking on an indefinite strike. 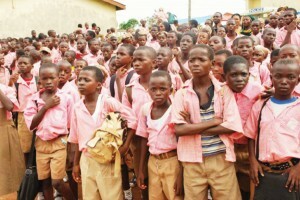 Speaking in Lagos on Wednesday, Momodu Braimah, the union secretary, said there was no alternative to the action. The union scribe said the NUT had put out directives to that effect and that unless the government was ready to listen to its demands, it would go ahead with the proposed action. Braimah stressed that the union had given government several opportunities to guard against the strike but to no avail. “We have given the government some time to act but they have paid a deaf ear; so, we have exhausted all peaceful means,” he said. Also speaking, the NUT Chairman, Samson Idowu, said that the teachers were only paid nine per cent of the allowance which was approved in 2008. “Lagos State has only implemented 9 per cent of the 27.5 per cent teachers’ allowance approved since 2008; which 17 states have implemented,” he said. A final congress is scheduled to hold tomorrow, Thursday to herald the strike.